Exploring more than 100 of the world's most important literary works and the literary geniuses that created them, this book is the perfect introduction to the subject of literature and writing. 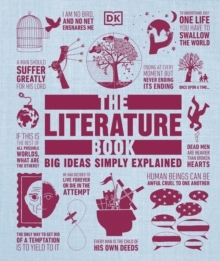 The Literature Book features over 100 of the world's most celebrated books, plays, and poetry, including Latin American and African fiction, and best-selling masterpieces from the most renowned authors ever to have lived. Stunning images and inspirational quotes jump out from the pages, while detailed plot summaries and feature boxes bring the timeless works of literature to life and set them into their wider social and cultural context. The book also offers a deeper look into the famed fiction of Shakespeare, Oscar Wilde, and more, as in-depth literary criticism and interesting authorial biographies give each work of literature a new meaning. From Fitzgerald's The Great Gatsby to Shelley's Frankenstein, The Literature Book is a must-have for any literature student or fan of fiction.